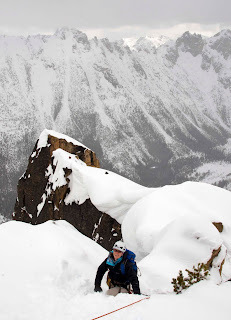 What is it about ice climbing? That's a good question. Yet another thing I have not done. It seems like the more I immerse myself into climbing, there more there is to do. More to try, more place to see, more gear to buy, more things to fall on, more friends to be made. It never gets old. Are we crazy? No. The first video, sure, I could probably try something like that. (Well, maybe not lead, but I'll toprope anything). What is it About Ice Climbing? from Eitan Green on Vimeo. The second video, probably not. Although, I do like the idea of deep (cold) water solo...ice climbing. So, when do we leave? The American Alpine Institute just received the following email from Denali National Park. None of our guides or climbers were involved in any of the incidents reported. This is simply for your information. 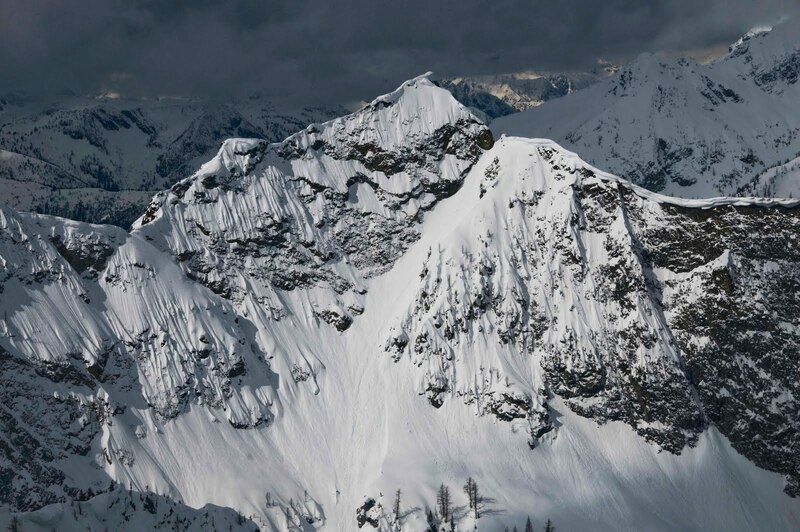 A Canadian climber was evacuated from the West Rib route of Mt. McKinley on Thursday afternoon, May 27. 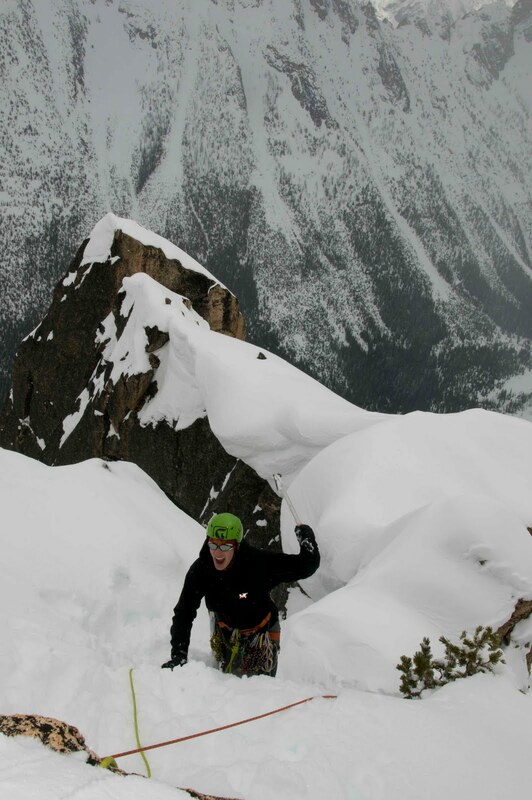 Luc Benoit, age 40 of Montreal, reportedly fell 1,000 feet while solo climbing the technically challenging West Rib route the evening of May 26. 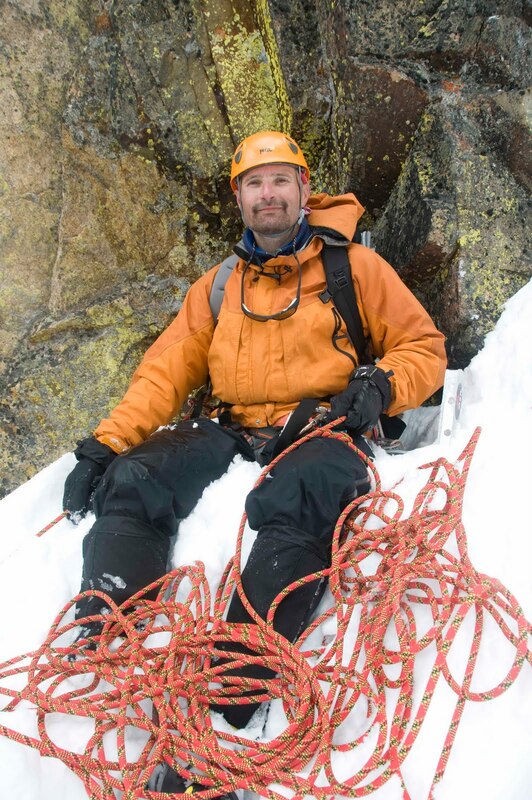 Unable to safely ascend or descend from his elevation at 14,000 feet due to an injured shoulder and a loss of gear, the following morning Benoit radioed for assistance from Denali National Park mountaineering rangers. At midday, the park’s A-Star B3 helicopter flew to the site with Denali mountaineering ranger Tucker Chenoweth on board. Unable to find a suitable landing zone, helicopter pilot Andy Hermansky performed what is known as a ‘toe-in’ landing maneuver, a stabilized hover technique in which only the tips of the skids touch down on the snow. Benoit was swiftly evacuated to the Kahiltna Basecamp at 7,200 feet where he was examined by an NPS volunteer physician, then flown to Talkeetna in a fixed wing aircraft and released from NPS care. Three additional air evacuations occurred earlier in the week. On the night of May 20, NPS rangers treated a guided client for high altitude pulmonary edema at the 17,200-foot camp. The following day, rangers assisted the patient down to the 14,200-foot camp, from where he was evacuated on May 22 when his condition did not sufficiently improve. On May 24, a non-ambulatory climber suffering from severe altitude illness was treated and evacuated from the 14,200-foot camp. His symptoms quickly resolved once he reached Talkeetna. Lastly, a climber experiencing acute pain and illness related to a kidney stone was evacuated from the 7,800-foot camp on the West Buttress on Wednesday evening May 26. The park helicopter transported him back to Talkeetna and transferred him to a ground ambulance for further medical care at Mat-Su Regional Medical Center. 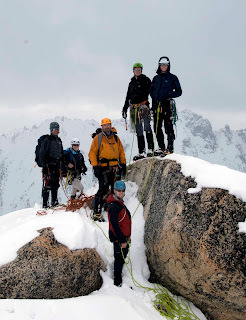 Denali mountaineering operations reach their peak this week. As of May 27, 452 mountaineers are climbing Mt. McKinley. So far this season, 165 climbers have completed their expeditions, 39% of which reached the mountain’s summit. 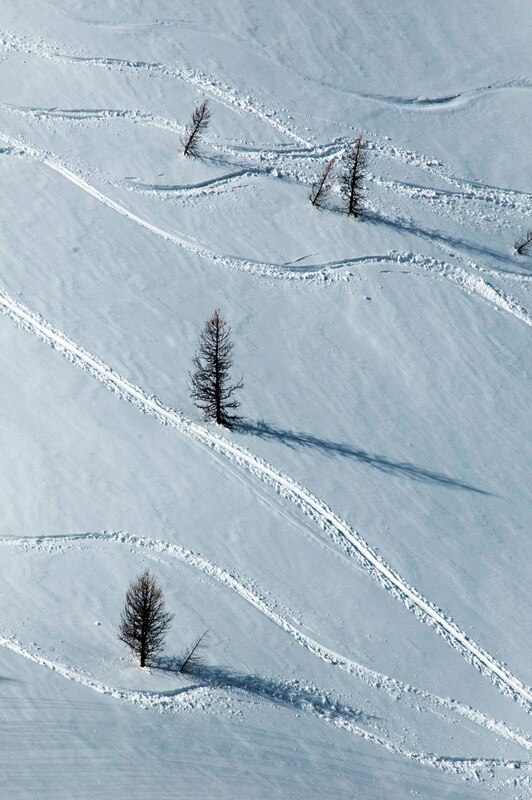 Steep snow or ice can be descended two ways. A climber could downclimb the terrain or he could rappel. Rappelling is always a dangerous option as a lot can go wrong...but in the mountains, sometimes the speed of rappelling is safer than downclimbing. In hard frozen snow or on ice, one option is to create a bollard. A bollard is essentially a tear-drop shaped pillar that is cut into a frozen surface with an ice axe adze. The rope is then wrapped around the bollard for the rappel. Once the rappel is completed, the climber can simply pull the rope. Bollards are not the strongest anchors available, but they are quick and effective. If you choose to use a bollard, it is important to do two things. Back them up and reset the rope after each rappel. To back-up a bollard, create the bollard and then preset the rope. Place a piece of snow protection (e.g. a picket buried as a deadman) and then loosely clip a sling to both the piece and to the rope. 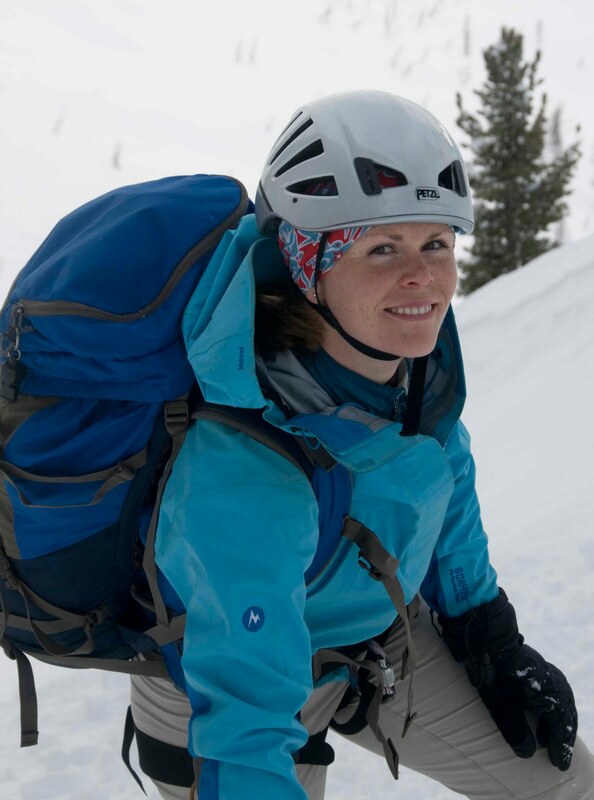 Once this is set-up, the heaviest person with the heaviest pack should rappel first. The theory is that if the heaviest person with the heaviest pack doesn't blow out the bollard, then a lighter person should be able to remove the back-up piece and safely rappel. To reset the rope after each rappel, simply treat the rope like dental floss. Pull on each end of the rope once your down. Resetting the rope like this will ensure that it doesn't freeze into place and get permanately stuck. Over the last ten years it has become more and more popular for rope teams on glaciers to tie knots between one another. The idea is that should someone fall into a crevasse, the rope will cut into the lip and one of the knots will get stuck, thus arresting the fall. We teach a lot of crevasse rescue at the American Alpine Institute and enjoy testing different theories while we're in the field. Most of our guides have done some level of testing on this particular glacier travel theory and amazingly enough, it works...sometimes. What we have found is that there are two types of knots. There are knots that are flat on one side and knots that go around the rope. Knots that are flat on one side, like an overhand or a figure-eight on a bite, tend to slide over the lip more easily than knots that go around the rope, like a butterfly. In our testing, what we've found is that early in the season, when there is more snow and the snow is softer, figure-eights and overhands will often bite the lip and hold. But as the season progresses and the lips become icier, the knots just slide right over. Butterfly knots are more likely to bite into the lip both early in the season as well as later. There are some disadvantages to knots on the rope between climbers. 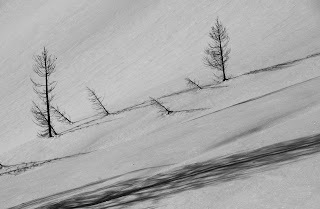 When there are a lot of sastrugi formations or penitentes on the snow's surface, the knots can get caught and will hinder movement. 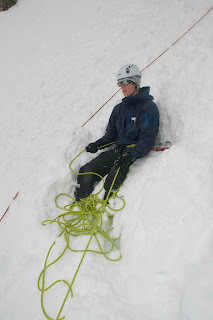 It can be difficult to haul a person out of a crevasse who is being held by a knot as you will have to pass the knots. It can also be difficult for a climber to prusik out and deal with the knot welded in the lip. I generally don't put knots in the rope on teams of four or more. There is so much weight in the system that it really isn't required. Three person teams are a little more difficult. If they are experienced, I usually don't put knots in the rope, but if they are novices, I'll usually put a couple knots in the rope. On two person teams, I always put butterflys in the center of the rope. It's better not to put too many knots in the rope. If there really is a crevasse fall, they might arrest a victim, but that doesn't mean that it will be easy for the person to get out. Instead, most guides put one to three knots in the rope between themselves and the other climbers. More than that generally just creates more problems. Knots in the rope are a nice additional safety measure, but they will not take the place of good technique and a solid set of skills. I've never been to the Sierras before (an abomination, I know). I hope to reform this anathema this summer on my road trip down to Prescott, AZ. Maybe I'll do the Hulk, I don't know. I do know, however, that there is something romantic and audacious about packing up your truck with nothing but a sleeping bag and climbing gear, and driving down miles and miles of American highways. 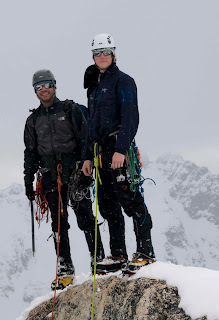 The first video is of Peter Croft and Conrad Anker; it won the John Muir Gold Award at the 2009 Yosemite Film Festival. The second video is by Ross Ching, an absolutely amazing still photographer based out of LA. It is part of his "Eclectic" series. I quote, "It’s amazing how many beautiful places you’ll come across when you go exploring without any real direction...". Great American Climbing Road Trips, I salute you. The Incredible Hulk - Solar Flare from Granite Films Jim Surette on Vimeo. 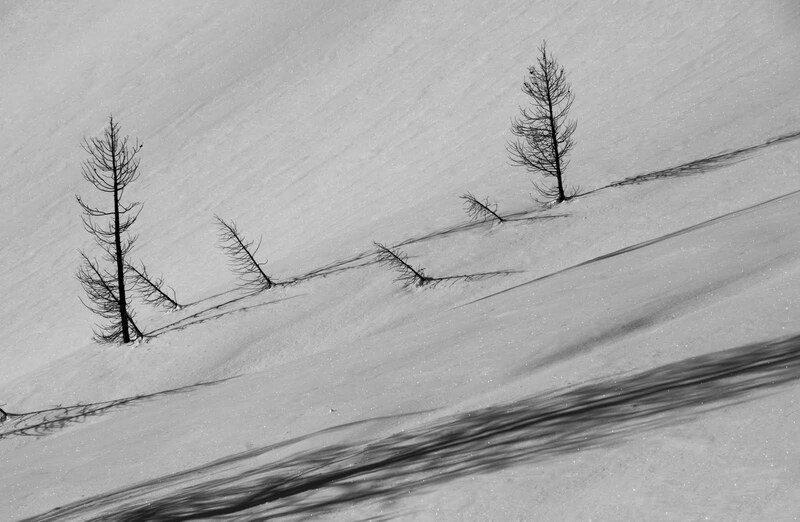 Eclectic 3.0: The Roads Less Traveled from Ross Ching on Vimeo. Check out our Sierra Programs here. There are a million ascending systems out there. On this blog we have previously discussed jugging with mechanical ascenders, the prusik hitch and climbing the rope with an autoblocking device. These are all excellent techniques for climbing up a rope...but it doesn't mean that they're the only techniques. Climbers are ultimately artists and part of the art of climbing is picking the right tool at the right time to get up or down something. As a result, the more things that you know, the more tools that you have in your toolbox. And the more things that you know, the more improvisational you can be in any type of climbing situation. This blog will provide you with another option for climbing up a rope. To set-up this system, you will need a mechanical ascender, a GriGri and a double-shoulder length sling. The following photo shows how each of these components will be used. Clip the mechanical ascender to the rope. Clip a double-shoulder length sling to the base of the ascender. This will become your be for your foot. Clip a carabiner to the top of the ascender, trapping the rope inside the ascender. Run the rope through your GriGri below the ascender. Redirect the rope from the break-hand of the GriGri up through the clip that is trapping the ascender on the rope. Once this is set-up you're ready to jug. Put your foot into the foot-sling and then stand up. Once you are standing, pull the backside of the rope through the GriGri. Sit back on the GriGri, kick you knee up to your chest and push the jug up the rope. Repeat until you're at the top. One important thing to always remember is that you will need to tie back-up "catastrophe knots" in the rope as you climb. This should happen every ten feet or so. One should never forget to do this, as occasionally GriGris slip. Obviously, the only way to really dial in this system is to practice it. The best way to work through this system is to print this blog out, bring it out into the field and then make it happen! People often talk about major news events and where they were when something important took place. Most Boomers know exactly where they were when they found out the JFK was shot. Most Gen Xers remember exactly where they were when the Challenger blew up. And everybody remembers where they were when they found out about the World Trade Center on September 11th. Local events often have the same type of impact. People who lived in Western Washington on May 18th, 1980 remember the day well. That was the day that Mount Saint Helens exploded. That was the day when the skyline of the Pacific Northwest changed forever. I was only eight-years old, but I lived in Seattle. Seattle is too far from the mountain to actually see it, but on clear days prior to the main event, we could often see ash rising high into the sky on the horizon. At 8:32 in the morning on May 18th, a small earthquake woke many residents of Western Washington. In Seattle it was just a little tremor. But at the mountain proper, the earthquake measured 5.1. It was a perfectly clear day. Everybody, everywhere could see the massive mushroom cloud of ash and dust rising thousands upon thousands of feet into the sky. 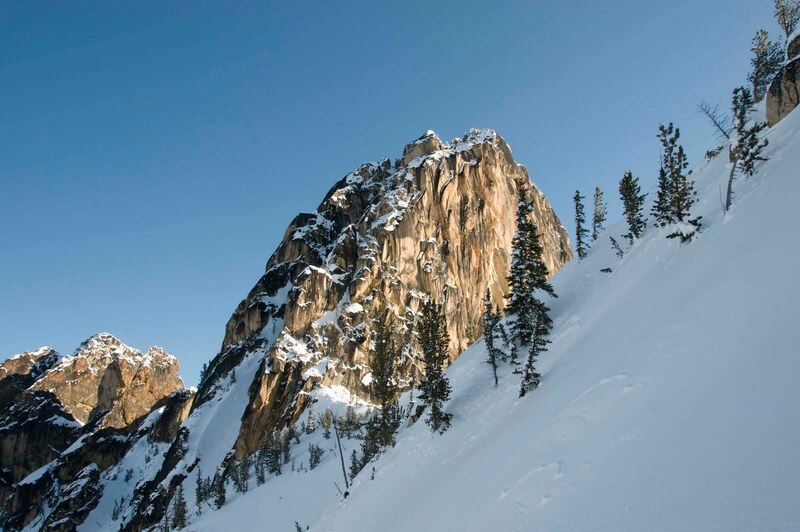 The north face of this tall symmetrical mountain collapsed in a massive rock debris avalanche. In a few moments this slab of rock and ice slammed into Spirit Lake, crossed a ridge 1,300 feet high, and roared 14 miles down the Toutle River. The avalanche rapidly released pressurized gases within the volcano. A tremendous lateral explosion ripped through the avalanche and developed into a turbulent, stone-filled wind that swept over ridges and toppled trees. Nearly 150 square miles of forest was blown over or left dead and standing. Today is the 30th anniversary of the event. It was 30 years ago today that 47 bridges were destroyed, 15 miles of railway was obliterated, 185 miles of road was erased, 250 homes were crushed and most tragically, 57 people lost their lives. Twenty-eight years later Mount Saint Helens still reminds us of the massive forces of nature. And it still reminds us how small we are in comparison to them. Take the 12 feet of webbing, put one end in your hand and stretch it out to full extension. At your farthest reach, pull the middle of the webbing to your waist. Take double this length (plus a little extra if you need room for error, like me) and cut it. Cut the elastic shock cord to mimic the length of the webbing. Open up the webbing and insert the shock cord into the webbing until it is all the way in. If your webbing is closed or "melted" at the end, just cut a little behind the tip and it will be easier to open up. Be patient, putting the cord inside the webbing takes time. After the cord is inside the webbing, feed the swivel onto the cord until it is exactly in the middle and tie an overhand knot. Stretch the shock cord 6-12 inches out of the webbing so the webbing bunches up, and tie a knot in the shock cord to hold it in place. Here comes the tricky part; tie an overhand on a bite in the end of the webbing so that when the swivel is attached to your harness and the overhand is clipped to your tool, you can fully stretch without the webbing becoming taught. I do not have a great way to explain how to do this, or how to measure in advance, except to say I messed up two or three times. That is why it is nice to have extra webbing/shock cord, and then just cut off the excess. If you are using spring snaps, make sure to feed them on the webbing and incorporate these into the overhand knot. The shock cord is running inside of the knot, which is what holds it in place. Repeat this process on the opposite side. With the smaller piece of different colored webbing, tie a sling using a water knot to the opposite side of the swivel. This piece of webbing will not have any shock cord in it. Attach the umbilical to your harness by girth hitching the small sling to your tie in points. Attach the two ends by clipping a carabiner that fits into the bottom holes of your ice tools. If you attached spring snaps, use those instead of the carabiners. If you don't have holes at the bottom of your tools, get creative. And there you have it, pretty awesome, homemade leashless tool umbilicals! Homemade gear always tastes... err.. works better right!? Two colored webbing is not necessary, it's just nice to be able to distinguish between the separate pieces of the umbilical quickly. If you are using spring snaps, make sure these fit in the bottom of your tool. You can really use anything to connect these to your tools, from small plastic carabiners to key chain rings. This took me about an hour to do, including an initial failed attempt. Buying "12" feet of webbing is not necessary, you could measure the amount you need in store and purchase only that amount. I estimated 12 feet because I figured only a giant would need more than that. You can use a lighter to melt the ends of the webbing back together so they don't fray. Kids ask your parents for help. These umbilicals are not meant to be used as a personal anchor system or as a "back-up" while placing a screw. They are not load bearing. I used two small, C.A.M.P Nano 23 carabiners to attach to my tools. If you use any kind of attachment method that isn't "full-strength" make sure they don't accidentally get used on your rack. While they may be heavier, I opted for full-strength carabiners to avoid any mistake. Notice where I girth hitched the blue piece of webbing, to my two tie-in points. If you girth hitch anything to your harness, be it a sling, daisy chain, or umbilical, do it to your tie-in points. Girth hitching to your belay loop limits its ability to rotate, which is important for reducing wear on one specific part of the loop. A good rood of thumb is that all soft goods should be attached to the tie-in points, and hard goods clipped to the belay loop. Over time, I found that I prefer to actually clip these to my belay loop, instead of girth hitching. Clipping allows me to remove it quickly with gloves, and is worth the little extra weight in my opinion. Let me know if you try to make your own and have any improvements to my directions or materials. I would love to hear your feedback! I'm pretty excited that I did this at the end of the season, right when they are no longer necessary.... 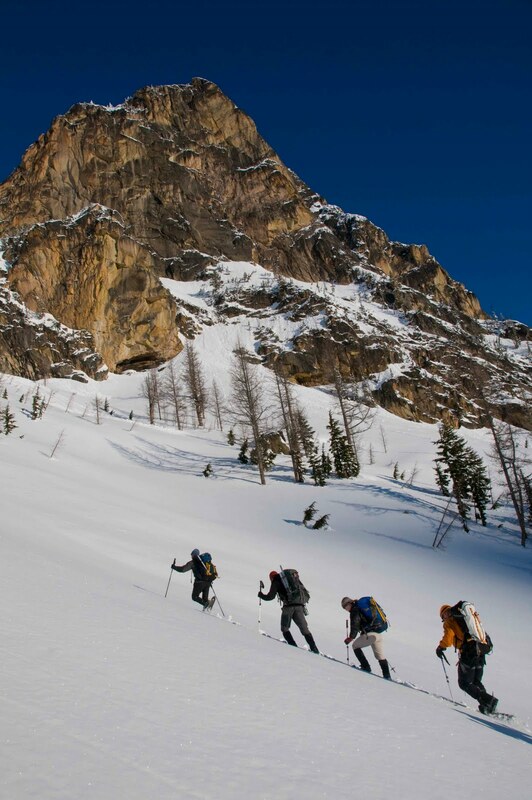 Wait, our ice season isn't over in the North Cascades! 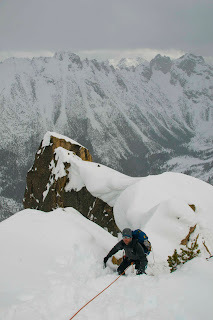 If I went out and climbed the North Ridge of Mount Baker I could get a ton of ice climbing in during the summer season! 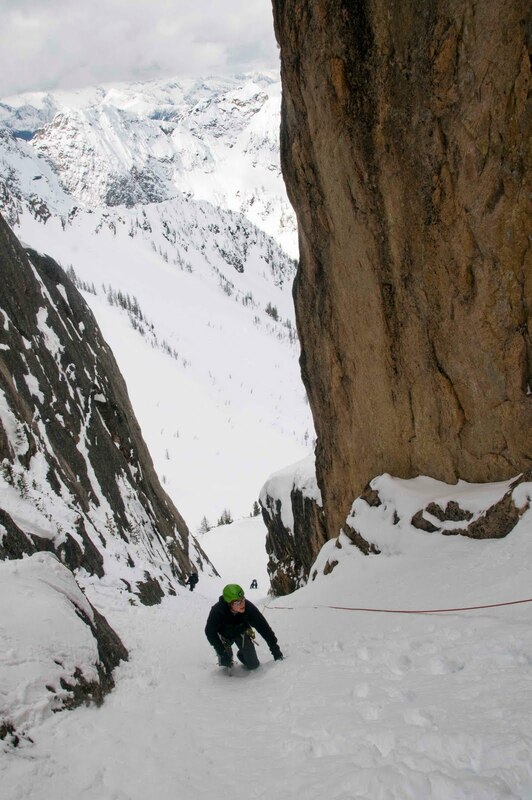 It's a good thing our Alpine Ice courses take people to the North side and climb that route. Make yourself a pair of these and come climb with us! There are times when people do things that are so new, so inspirational, so out of this world, that you just can't believe it. It makes you wonder how they even thought up such a ridiculous idea, and what gave them the courage to try it. These next guys are pioneering something they like to call, "liquid mountaineering." Get out and try it. While the following video's legitimacy may be somewhat debatable, the following sport is the real day. I feel like it is a cross between volleyball, Thailand's Takraw, and Slam Ball. I know neither of these videos have much to do with climbing or skiing, but they are people who are trying new things and keeping it interesting! At the very least, they remind us to lighten up, and I think we all need that from time to time. Volunteers are needed to teach day hikers, backpackers and climbers on the three busiest Mt. Baker area trail systems: Heliotrope Ridge, Park Butte/Railroad Grade and Heather Meadows. As a Mountain Steward volunteer you will train in low-impact recreational skills, natural history and back country management. Volunteers work in the lower segments of the trails with fellow Mountain Stewards interacting with the public for three daytime shifts. Qualifications: Volunteers must be 18 years or older with hiking and outdoor recreation skills. Timeline: Volunteers attend training July 10 & 17 and commit to volunteer a total of three weekend days between July 24 – Sept. 12. An optional training for Heather Meadows volunteers is July 24. Apply: Return the application by June 25. Applications are at www.fs.fed.us/r6/mbs/volunteerin/mtn_steward and can be emailed to brichey@fs.fed.us. Mail to Mt. Baker Ranger District, Mountain Stewards, 810 State Route 20, Sedro-Woolley, WA 98284, or fax to 360-856-1934. Call 360-854-2615 for more information. It's that time of year and people are starting to climb glaciers all over the Northwest and in Alaska. As such, we thought it would be a good time to review all the skills required for crevasse rescue systems. The following crevasse rescue description is based on the course work provided by American Alpine Institute field guides. This systematic description will make the most sense to those students who have worked with AAI in the field on crevasse rescue systems. This two person crevasse rescue description is broken into three parts. The first part is entitled Anchor; the second, Z-Pulley and the third, C on Z. Most students obtain the best results when they think of this as a dynamic three part system. Students have problems and get lost when they lose sight of their objective. Any time one gets lost while working through the system they should step back and think clearly about what they are trying to do in that part of the rescue. Self-arrest and place your foot over the rope. Be sure to kick your feet in firmly to hold the weight. Place a piece of snow or ice protection and attach it to a locking carabiner. This locking carabiner will thus be designated the "master carabiner." This first piece of snow protection must be extremely good. If it is not, both the victim and the rescuer will be in serious danger. Attach your foot prussiks to the master carabiner. Lock the carabiner and NEVER OPEN THE MASTER CARABINER AGAIN! Keeping your ice-axe handy, slowly allow the victim's body to weight the anchor. Be sure to keep your ice-axe within reach until the anchor is complete. If that first piece of protection blows out, you will need to arrest again. Take the rescue coils off of your shoulder and slowly unwrap them. Be sure not to panic as the mountaineers coil is easily tangled. Estimate the distance up to the master carabiner, then estimate the distance from the carabiner to the crevasse. Add these two figures together and then tie a figure-eight knot in the rope at this length. 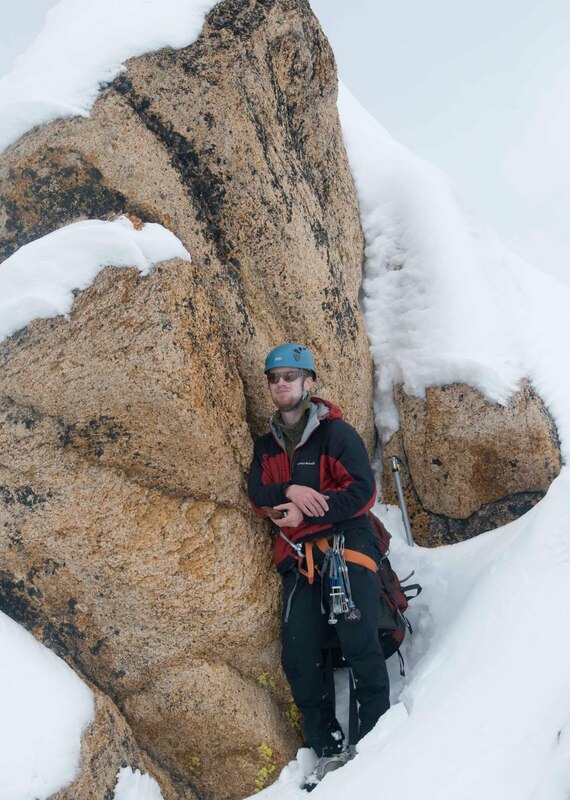 If there is a large amount of crevasse danger in the area, you may have to tie this knot significantly closer to yourself in order to protect yourself. Clear one of the two locking carabiners that you are tied into the rope with of all items. Clip the new figure-eight knot into this carabiner. Clear the second carabiner of everything. Leave your waist prussik on the rope. Work your way up to the master carabiner. Tie a figure-eight knot into the rope that is being held by your foot prussik. Using a locking carabiner, clip this into the master carabiner and lock it. This will back-up the prussik which is currently holding the victim's weight. Step nine is where you will back-up the first piece of protection. It is important not to disturb this piece of protection while placing the second piece or all will be lost. Measure the distance from the master carabiner to your second placement. Be sure that when you place the second piece, you consider the length of the sling or cordellete with the carabiners on them. You want this second piece to be as equalized as possible. Beginner level students will stretch a sling as tightly as possible from the master carabiner to the second piece, where advanced students may use the block and tackle with a cordellete. Once you complete this, the Anchor is finished. Take your pack-prussik or a shoulder-length sling and girth-hitch it to your waist prussik which is still on the tensioned rope. 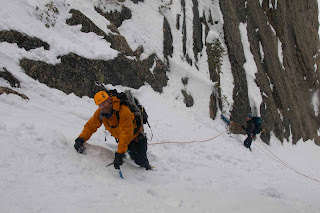 If you are wearing crampons, be very careful not to step on the rope. Clip this extension to the unused locking carabiner at the tie-in point on your harness. Work your way toward the crevasse while probing for additional crevasses with your ice-axe. You may have to re-tie your safety knot to reach the crevasse. Re-tie this knot whenever it is necessary. 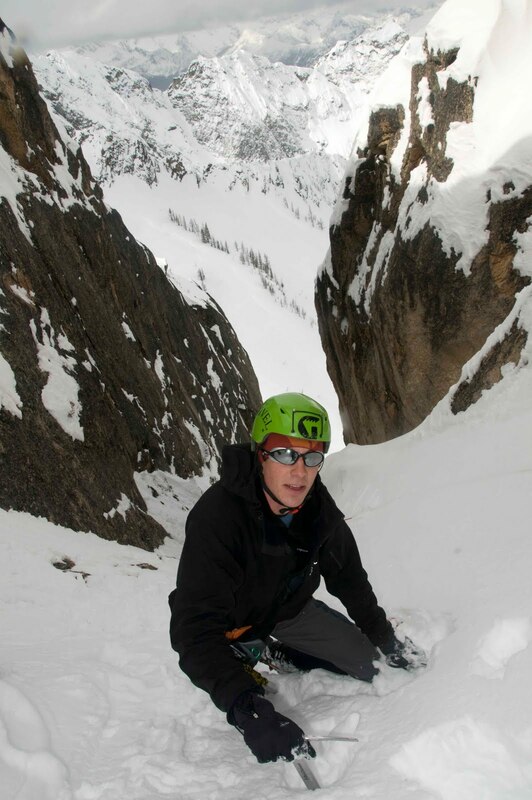 Once you reach the lip, confirm that your partner is conscious and needs to be pulled out of the crevasse. If he or she does not answer, you will have to rappel down into the crevasse to see what is wrong. 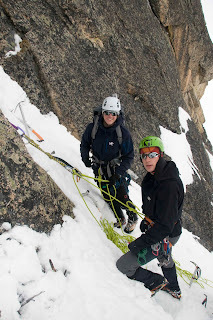 To climb back out of the crevasse it is possible to use your partner's prussik cords. Pad and clear the lip before rappelling. If your partner answers and says that he or she needs to be pulled out, clear the lip of all snow. Warn your partner before you start to kick snow down on top of them. The entire rope should be visible at the lip of the crevasse before you are finished. Slide your ice-axe under the rope at the lip in order to pad it. Place the pick into the snow in order to secure it. Clip the axe to the rope so that it does not fall down into the hole. Unclip the extension attached to your harness. Take the pack prussik off of your waist prussik. You should still be relatively close to the lip of the crevasse when this takes place. Clip a pulley to the waist prussik. Run the rope coming from the master carabiner through this pulley. The waist prussik may also be reffered to as the "tractor." Walk back up to the master carabiner. Clip a second pulley into the master carabiner and run the rope that is clipped to the locking carabiner on the master carabiner through the pulley. It doesn't matter which side of the knot you attach the pulley too. Untie the knot next to the pulley, but leave the locking carabiner attached to the master carabiner. Pull on the line that you are tied too. Haul the vicitm up approximately a foot. Untie the knot between the pulley attached to the master carabiner and the foot prussik. The foot prussik may be reffered to as the "ratchet." You may now haul the victim on a 3:1 system. Remeber to mind the foot prussik (ratchet) while hauling, and be aware that for every three feet you pull, the victim will only rise one foot. You have now completed the Z-Pulley. "To add the C, I must tie the end of the rope into the anchor!" This is usually chanted during some guides trainings for a reason. If you remember this, the rest will make more sense. Tie a figure-eight knot into the end of the rope and clip it into the locking carabiner that is still attached to the master carabiner. Tie a knot next to the pulley nearest the crevasse lip and clip a carabiner into it. This knot may be a clove-hitch or a figure-eight. Advanced students may place the pack prussik on the haul line here with a non-locker clipped to it. This carabiner may also have an additional pulley on it if you have one. Clip the line that you just clipped into the locking carabiner into the new carabiner down by the pulley nearest the lip. This is your new haul line. You now have a 6:1 hauling system. It is important to realize that you must haul six feet for every foot that the victim rises. You have completed the C-Z Pulley system. The photo to the left shows a completed anchor. The red carabiner is the master carabiner. Note that there are two pieces of gear. The first piece placed was a snow fluke. The back-up piece was a picket buried in a t-slot. The blue carabiner is the backup line. This photo shows a completed Z-Pulley anchor. There will be one more step for the rescuer in this picture. He will have to release the figure-eight knot from the blue locking carabiner before the rescue can continue. The blue locking carabiner should stay in place for later use. This photo shows a completed Z-Pulley system. The rescuer need only to pull on the "haul line" in order to get his partner out of the crevasse. 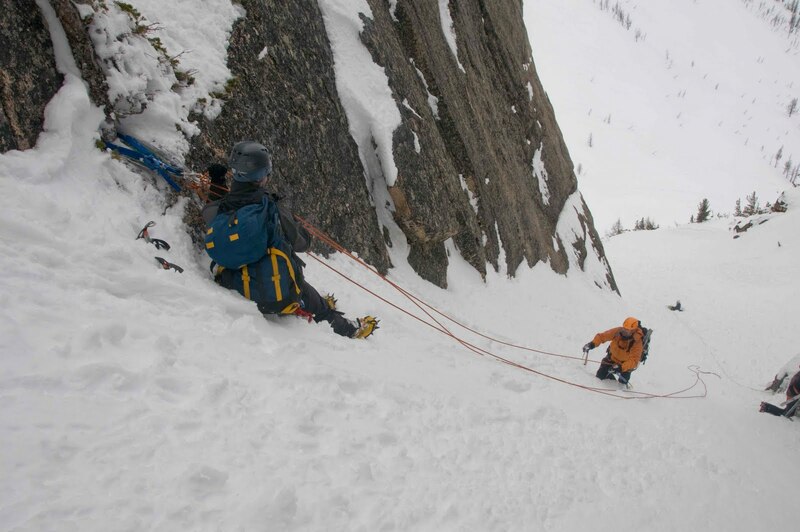 This photo shows a climber hauling her partner out of a crevasse with a completed 6:1 pulley system. We often refer to this as a C-Z Pulley system. Always pull away from the crevasse. If the victim suddenly becomes more difficult to pull-out check the victim. Do not crush the victim in the lip of the crevasse. Make sure the victim keeps his hands from behind the rope as it cuts through the lip. Lock all carabiners. You only need two locking carabiners aside from the two on your harness to complete this rescue. If you can haul the person out on a 3:1, then do it. It will be faster. Once you understand the system, experiment with short-cuts. Do not experiment until you have a concrete understanding of the whole system. I just got back from a trip to Washington Pass for the last two days of and AAI ice course. This was a back up plan due to terrible weather on Mt. Baker. These photos are from a climb of the the west gully on South Early Winters Spire. Weather was great in the morning, however the snow conditions made for some difficult trail breaking. The view of the peak from the approach. The route goes up a snow gully on the left side of the peak. One of the rope teams at an anchor. Blue Lake Peak as the weather worsened. Charlie leading up the gully. 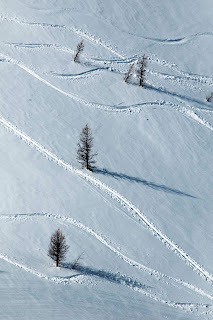 Ski track between the larches below. Group shot on the summit. One of the most inconsistent things in the entire world of climbing are climbing commands. Climbers commonly hook up for a day of climbing with little knowledge of how to communicate with one another at the crag. It is always important to review your climbing commands with a new partner so that no mistakes are made. The most common mistakes in a command series tend to come around the word "take." Climbers often use the word in two different ways. Some will say "take" in lieu of the command, "up rope." Whereas others will say "take" to mean "take my weight." A much larger problem arises out of the nature of a word that only has one syllable. "Take" could also be mistaken for the words, "safe" or "slack." Either of these mistakes could have tragic consequences. The result is that we try to teach people not to use the word. The following sets of commands reflect what AAI guides are teaching in the field. Belayer: (After checking that everyone's double-backed, that knots are correct and that the belay device is threaded appropriately.) Belay-on. Belayer: (After pulling the stretch out of the rope and locking it off.) Tension-on. It's important to close out the commands at the end. People often get lazy about the next set. Once the climber is back on the ground the following commands should take place. Belayer: Thank-you. (Then after removing the device from the rope:) Off belay. The "thank-you" exists in this series to get individuals ready for multi-pitch climbing where the words are used a great deal. You'll notice that the words "thank-you" are used heavily throughout this command series. We use the words to acknowledge that an individual heard the last command. For those who don't normally use the words "thank-you" as part of your personal series, I would recommend trying it. 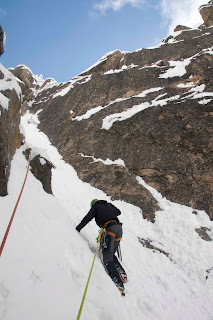 A lot of stress melts away on multi-pitch climbs when you know that your partner heard you. Belayer: Thank-you! (The belayer will then take the rope out of his device.) Belay-off! Climber: Thank-you! (The climber will then put the belayer on belay.) Belay-on! Belayer: Thank-you! (The belayer will break down the anchor and then yell just before he is about to climb.) Climbing! Rock -- This should be yelled whenever anything falls. If you hear this, press your body against the wall and do not look up. Your helmet will provide some protection. Unfortunately, sometimes people yell "stick" or "camera." Such unusual commands often result in inappropriate reactions. In other words a person may not immediately attempt to get out of the way. Watch me -- Climber will say this to a belayer if he is nervous and thinks he might fall. Falling -- The appropriate command if you actually fall. Up-rope -- When a climber says this, he is asking that slack be eliminated from the system. Slack -- The climber needs slack. Tension -- Anytime a climber wants to sit back on the rope and rest they should use this command. Clipping -- Periodically a leader will need more rope to clip a piece of protection. When a leader says this he's actually asking for a few feet of slack. You are invited to participate in a process that will help guide the management of Joshua Tree National Park for the next 15 to 20 years. We are beginning the development of a new park management plan and we welcome your involvement. Come and meet the planning team, learn more about the general management plan and planning process, and most importantly, discuss your ideas and concerns for the future of Joshua Tree National Park. Please attend one or more of these open houses. We look forward to seeing and hearing from you! Monday May 17, 6-8 p.m.
Tuesday May 18, 6-8 p.m.
Wednesday May 19, 6-8 p.m.
Thursday May 20, 6-8 p.m.
Friday May 21, 6-8 p.m.
AAI Learn to Lead Giveaway with Moosejaw Mountaineering! It's official! Moosejaw Mountaineering is giving away a Learn to Lead course! No purchase necessary, all you have to do is head on over to their website and enter your email address between May 10th and May 19th. It's that simple! If you head on over to our Facebook Page during the week and "Like" us, you will have a chance to win a free American Alpine Institute T-Shirt! Every day next week we will be picking a member of our Facebook page at random and sending you a shirt! We will put instructions up on our page soon, so make sure to check it often! "Redundant" simply means that there is more than one element involved in every aspect of the system. "Equalized" means that the all the weight is evenly distributed. "No Extention" means that if one piece fails, the anchor will not shockload other parts of the system. John Long's How to Rock Climb series added an element to the acronym. In his books he began to use SRENE. The RENE part remained the same, but he added the "S". This stood for "secure" or "strong." In other words, are all the pieces strong and secure? The 2008 AMGA Single Pitch Instructor manual added another letter to the acronym. In this recent publication they made the acronym, SERENE. The new "E" stood for "effective;" as in, was the construction of this anchor quick? Was it well-placed? Does it do the job without too much equipment or fuss? Popular books like Freedom of the Hills, Rock Climbing: Mastering the Basic Skills, and Alpine Climbing: Techniques to Take You Higher have gone a completely different route. Instead of SERENE, they use ERNEST. The only real addition to this particular acronym is the "T" for "timely" which could well equate to the "E" for "effective." We have recently had some problems with our dispatch page on our website. Some readers are unable to read it with certain computers. As a result, we posted early dispatches on this blog. "Hey, it's Forest again. We are sitting here in Camp 2, getting ready to head down and get our cache. We had quite a journey to get up to Camp 2, climbing through a whiteout and blowing snow. The team did great though and everyone got to sleep in this morning, which was much appreciated! We woke everyone up with hot sausage biscuits for breakfast along with hot coffee and tea. Quite a welcome treat after a very cold night at around -23 C (-9.4 F). Well, we've got to get moving and grab this cache." To read about a wide variety of climbing topics, trip reports, and outdoor news, check out our blog. "Hello, this is Forest reporting from Denali. It's another beautiful day here on the mountain and we are getting ready to make the move from Camp 1 to Camp 2. It's going to be another long day but we've got a really strong team up here full of hard workers so we shouldn't have any problems. The cache went off without a hitch yesterday and as we came back into camp our final team member Krushnaa Patil was waiting for us. Her flight was delayed due to the Icelandic volcano eruption but now she is back with the team and we are excited to have her." "It is fairly quiet on the mountain this early in the season so it is pretty nice not to have to battle any crowds. We had a wonderful middle eastern feast last night. Luckily enough for the team I was able to resist performing a belly dance routine! Well, we've got to pack up now. Talk to you all again soon! "Forest and I are at Camp 1 now. Things are going really well, we're making french toast for breakfast and getting ready to make a cache below Camp 2 at 11,000 feet. Yesterday was good. It was pretty chilly in the morning, one of those lingering cold spells, so it took a little while to get warmed up and moving. Once we finally got moving and made it downHeartbreak Hill it quickly warmed up and felt like we were climbing in California! Of course these warm temperatures didn't last and before too long a low cloud system moved in and brought high winds for about three hours. It cooled down quick and the team performed beatifully setting up camp quickly, not the easiest of tasks in those high, cold winds. We settled into camp quickly and enjoyed a delicious dinner of fat, juicy burgers! A well earned meal by all! Everyone is very pysched to be up here and climbing strong, we'll talk to you all again soon!" Hello this is Forest and Mike. We are headed to bed here at the Kahiltna air strip. It is a beautiful day with a lovely arrival on the Kahiltna Glacier, and a delicious dinner of thai peanut sauce on rice noodles with salad. Just settling into the groove of things. Everyone is well and we are planning to move up to camp one tomorrow. We'll drop you a line tomorrow to update you on our progress. Take care, bye bye!